Dysphagia is the medical term for difficulty swallowing. It is characterized by a more than normal effort to transport food from the mouth to the stomach. Although dysphagia is often considered a sign or symptom, it is sometimes a condition in its own right. Difficulty swallowing is actually quite common among the elderly, and it can lead to dehydration, aspiration pneumonia, malnutrition, and even death. In the U.S., dysphagia affects 300,000 to 600,000 people each year. What is Dysphagia OR difficulty swallowing? Swallowing is a complex process that involves several different nerves and muscles. When we see, taste, or smell drinks and food, saliva is produced to help make chewing easier. We then chew until it becomes a soft bolus, which is a mass of food that is ready to swallow. The tongue then pushes the bolus to the back of the mouth to the pharynx, where swallowing becomes an automatic reflex. Next, the larynx closes to prevent food or liquid from going down the windpipe, and into the lungs. And finally, the food travels into the esophagus, where it is pushed into the stomach. Low Dysphagia (Esophageal Dysphagia): This type of dysphagia happens in the esophagus, and there is an irritation or blockage that often requires a surgical procedure. High Dysphagia (Oropharyngeal Dysphagia): This type of dysphagia happens in the throat or mouth, and is sometimes caused by tongue weakness after a stroke. It can also occur from difficulty making saliva. Throat issues are often caused by a neurological problem. It is also important to note that pain when swallowing, or odynophagia, is not dysphagia. However, it is possible to have both problems simultaneously. Globus is a related condition where you feel something is stuck in the throat without difficulty swallowing. Some people with dysphagia may be unaware they have it. As a result, the condition may go undiagnosed and lead to malnutrition and dehydration. If left untreated, this raises the risk of a lung infection called aspiration pneumonia can develop after accidentally inhaling food particles or saliva into the lungs. 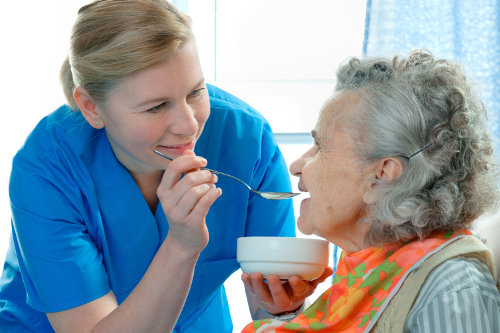 Dysphagia appears to affect the elderly population at higher rates. With age, comes changes in the physiology of swallowing as well as medical conditions that may affect swallowing ability. In 2010, the U.S. Census reported 40 million people with dysphagia above 65 years old. Difficulty swallowing also affects up to 64% of patients after stroke; up to 30% of elderly admitted to the hospital; and up to 68% of the elderly living in nursing homes. Taste and smell sharpness, age-related decline in oral moisture, and subtle motor changes may contribute to a lowered swallowing ability in the elderly. Treatment for dysphagia often depends on the cause of the condition. Because oropharyngeal dysphagia is often a neurological problem, treatment is often challenging. Sometimes medications or corticosteroids are given for dysphagia linked with GERD. Tube feeding may be necessary if swallowing safely and smoothly is not possible, or if swallowing does not support enough hydration or nutrition. Surgery may be needed in cases of an esophageal tumor, achalasia, or pharyngeal diverticula. Esophageal dilation is also a procedure for people with a tight esophageal sphincter. What about more natural treatments for difficulty swallowing? A speech-language pathologist will use various intervention strategies like rehabilitation techniques and compensatory techniques. Here are five other treatments or natural remedies for dysphagia. Postural adjustments are changes in the head posture and body that may be recommended to reduce residue or aspiration. Posture changes may alter the direction or speed of a liquid or food, and this can protect the airway to help patients swallow safely. Postural adjustments are short-term treatments where the speech pathologist will work with patients to decide the best posture change. Some specific postures include side lying, head back, chin tuck, head rotation, and head tilt. Some studies suggest that acupuncture can help people with difficulty swallowing after a stroke. One 2008 study suggested that acupuncture was effective for dysphagia in some acute stroke patients. In the acupuncture group, 12 of 34 patients recovered to the point where normal feeding was achieved. Oral-motor exercises may also increase the range of movement in someone with dysphagia. This will help with swallow functioning and speech. Treatment may stimulate the jaw, lips, tongue, pharynx, soft palate, larynx, and respiratory muscles. Depending on the degree of dysphagia, oral-motor treatments will range from passive to active. Range of motion exercises will help with tissue or structural damage associated with dysphagia. Resistance exercises will strengthen muscles, and involve pushing against a spoon or tongue depressor to create resistance. Long-term care facilities and hospitals will use heavy, thick liquids as an intervention for difficulty swallowing. Thickened liquid will help control the direction, duration, speed, and clearance of chewed food. In general, the thicker the liquid, the slower the liquid will move, and this makes it easier to swallow. Difficulty swallowing natural treatment also includes diet alterations. Modifying the texture of food may make swallowing safer. This may include eating smaller and more frequent meals, altering the thickness of liquids, or pureeing solid foods. A change in temperature and taste of food will sometimes make it easier to swallow as well. If you have difficulty swallowing, or are unable to swallow, you should see your doctor. If you cannot breathe due to food obstruction, immediately seek emergency help. Also, medical specialists that treat dysphagia include a gastroenterologist, otolaryngologist, neurologist, and speech-language pathologist. Remember that the best treatment for dysphagia will depend on the cause. Some of the best natural treatments for difficulty swallowing include acupuncture, diet changes, oral-motor exercises, postural adjustments, thickened liquids, and swallow maneuvers. If these therapies aren’t helping, a feeding tube may become the best course of action. Nordqvist, C., “Dysphagia: Symptoms, Diagnosis, and Treatment,” Medical News Today, Nov. 25, 2016; http://www.medicalnewstoday.com/articles/177473.php. “Difficulty Swallowing (Dysphagia) – Overview,” WebMD; http://www.webmd.com/digestive-disorders/tc/difficulty-swallowing-dysphagia-overview#1, last accessed Feb. 15, 2017. “Dysphagia,” American College of Gastroenterology; http://patients.gi.org/topics/dysphagia/, last accessed Feb. 15, 2017. “Acupuncture for dysphagia in acute stroke,” PubMed Health, Feb. 6, 2008; https://www.ncbi.nlm.nih.gov/pubmedhealth/PMH0013717/.